While 2016 candidates discuss everything from Donald Trump's latest insults to what their Secret Service codenames would be, many voters have one message: It's the economy stupid. The "economy, in general" was cited as the U.S. most important problem in Gallup's last poll on the subject, with "dissatisfaction with government" following one point behind. Recent data from the Census Bureau puts some data to those complaints. 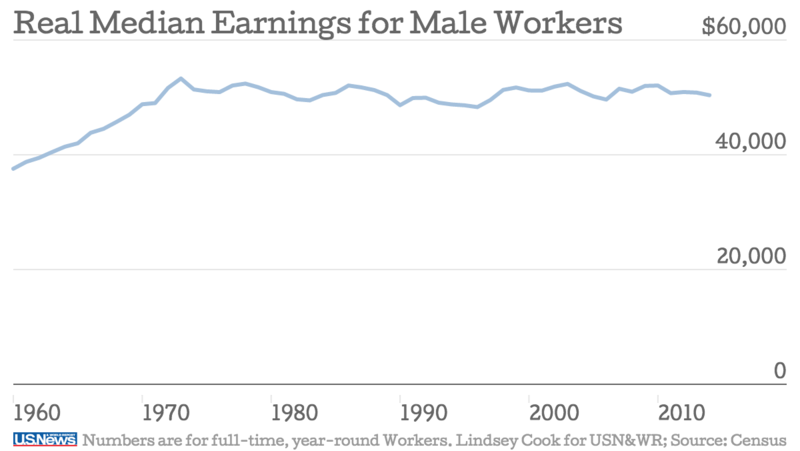 In 1972, the average full-time, year-round male worker made $51,649. In 2014, that number was $50,383. After four decades real earnings for men are actually less, even despite a 2.5 increase in worker productivity, as the Brookings Institute pointed out in a recent editorial. Women, on the other hand, have seen more than 30 percent increase over the same period, which has lessened the gender gap. Women still make only 78 cents for every dollar a man earns, though. The Republican candidates will have a change to discuss this and other economic issues at the next debate (focused on the economy), which hosted by CNBC in Boulder, Colo. on Oct. 28.